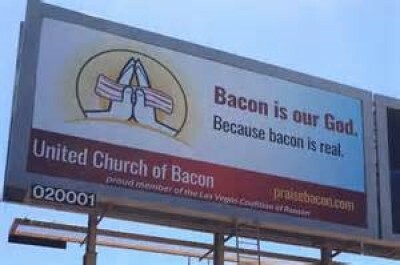 Move over Spaghetti Monster, The Church of Bacon is new in town! 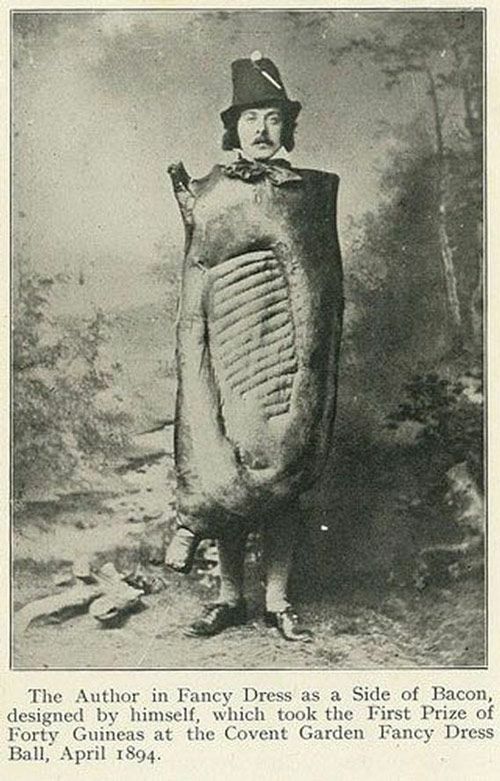 With bacon's popularity peaking its an idea whose time has come. Update: For those who are reticent to take a Google survey (sorry about that) Here is a link to the Church of Bacon website. I've heard about using a car engine to cook breakfast (in fact, that idea is immortalized in Rick Altergott's great artwork for WU -- see the side column), but this is the first time I've seen a gun used for the same purpose. Pigs raised on feed containing Templeton Rye Distillery's spent rye mash. The ultimate in flavor infusion! 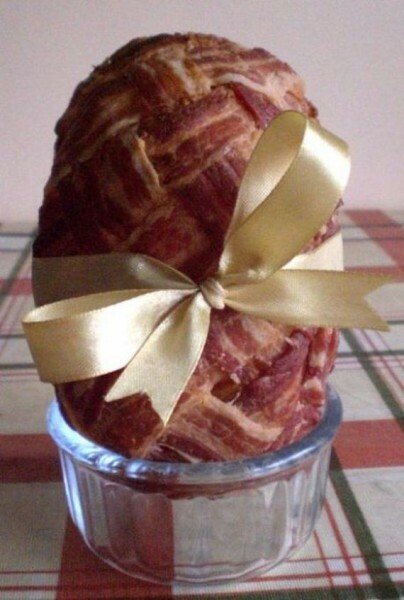 A bacon Easter egg! I'd certainly fill it differently, but the idea is deliciously appealing! The crackers may be good, but its still not the real deal! A disease that affects pigs has made its way to the US recently. Adult pigs get sick and have diarrhea and vomiting then they recover but newborn piglets do not fare as well. As many as 80% of piglets that get the disease die from dehydration. 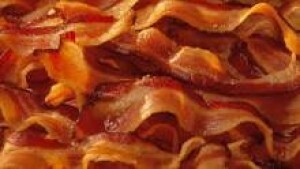 So look out bacon lovers, the price is going up, up, up. 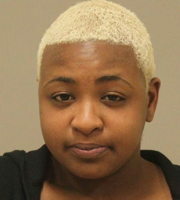 Last year, gdanea reported on WU that Oscar Mayer was offering bacon gifts for father's day. Now Oscar Mayer is back in the news with an iPhone attachment that functions as an alarm clock by waking you with the smell of bacon. Details at wakeupandsmellthebacon.com. They've created a slightly surreal video to promote the gadget. A clock that wakes you with the smell of bacon isn't an entirely original idea. 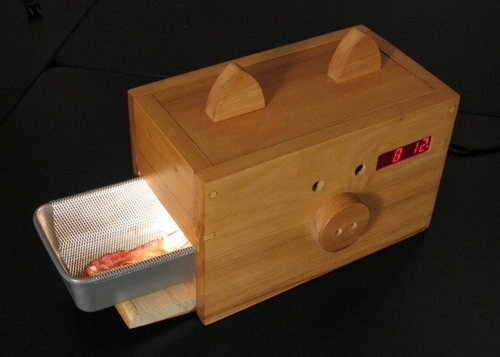 Back in 2009, Matty Sallin designed a clock that would wake you by actually cooking bacon. The smell lasts for up to 10-15 washes. Available here for $22. 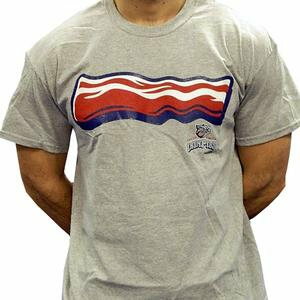 The shirt is being sold by the the Lehigh Valley IronPigs minor-league club, which is also introducing bacon-themed uniforms. More info here.